Someone asked me when I said I saw this, whether it was good or not. Its almost too reductive to say good or bad. This is a very, very difficult film. 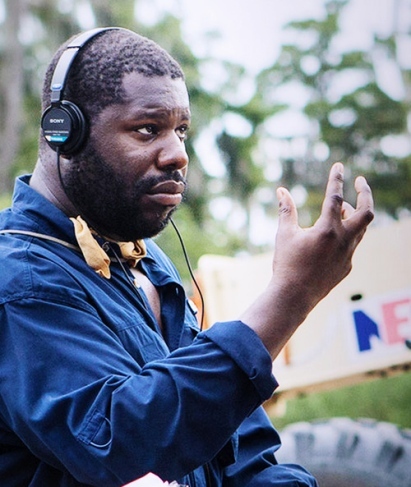 Steve McQueen directed, the screenplay by John Ridley, starring Chiwetel Ejiofor (say it with me now: “Chewy-tell Edgey-oh-four) , based on a true story. An educated working-class free black man from the north, is kidnapped. and sold into slavery over the course of over a decade long ordeal. To say this is emotionally devastating is to take nothing away from the technical and artistic achievement of this film. This movie is extraordinary, and extremely uncomfortably gutwrenching films I’ve ever sat through. 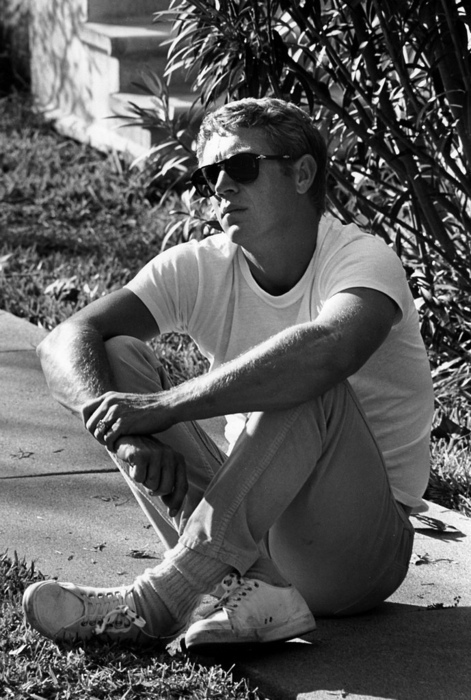 I’ve loved Steve McQueen’s previous entries, all both of them. No not that Steve McQueen. 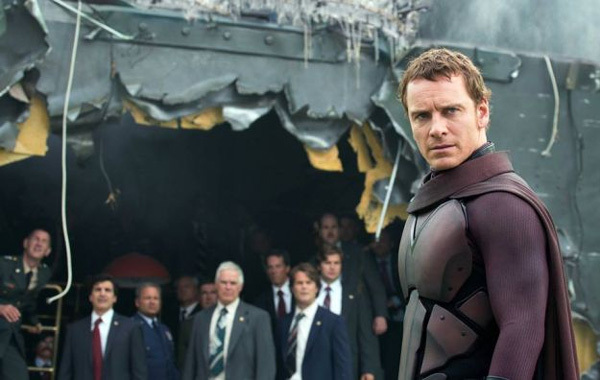 McQueen has a crush on Magneto. still no white hair eh? Its just as well, ’cause so do I. Fassbender is to McQueen, what Johnny Depp is to Tim Burton. Only both have talent. Fassbender has starred in every one of McQueen’s movies, including one of my favorite performances of the last 10 years: Hunger, based again on the true life story behind the 1981 Irish hunger strike. 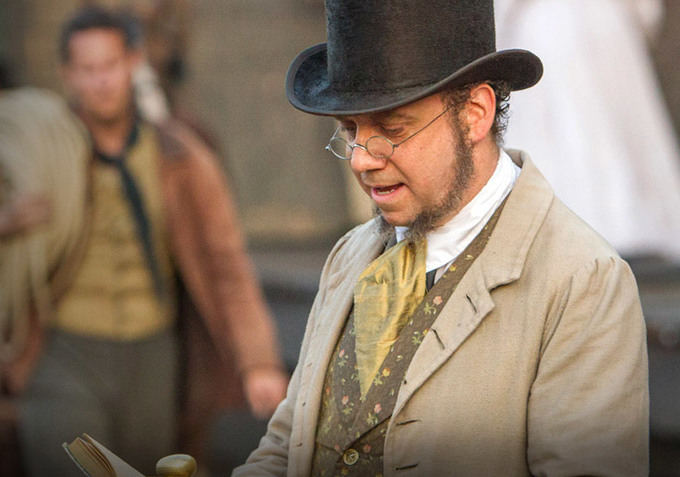 Here Fassbender plays an unhinged slave owner, who’s performance almost takes away from the lead…but not quite. It is the opposite performance to the dignified performance by Ejiofor. 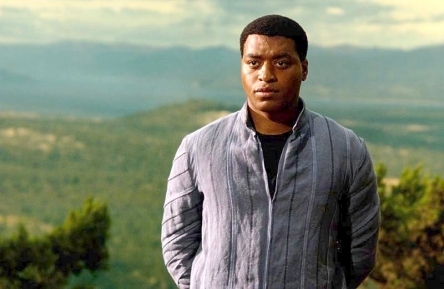 Nerds might remember Ejiofor from Serenity. You know, that movie that wasn’t good, based on that show, that wasn’t that good either. you sure this wasn’t a TNG episode?! Myself & most girls will probably recall him from Love Actually. You know, the cuckolded husband, married to Keira Knightley. Yeah her. The chick who’s not hot, but you’re girlfriend insists that she is. the chick I still don’t see why people think she’s hot. You remember the scene: when Rick from The Walking Dead was in love with before the zombie apocalypse. no Rick, YOU are perfec! The lighting, cinematography, editing and music all deserves admiration. McQueen’s camera is unflinching in its gaze on human pain and suffering through humiliation. But the virtues of this film are really embodied in Ejiofor’s performance. 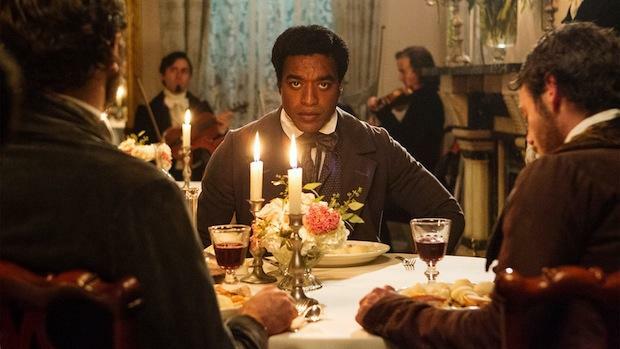 He is the glue that we keep coming back to, reminding us of the travails of wait-what-this-person-was-real Solomon Northup. Thats what this film ultimately must be about. McQueen seems to be concerned with the evils of slavery. It could be said, that we know such evils, and McQueen could have established this quite early. However we don’t really know, now do we? 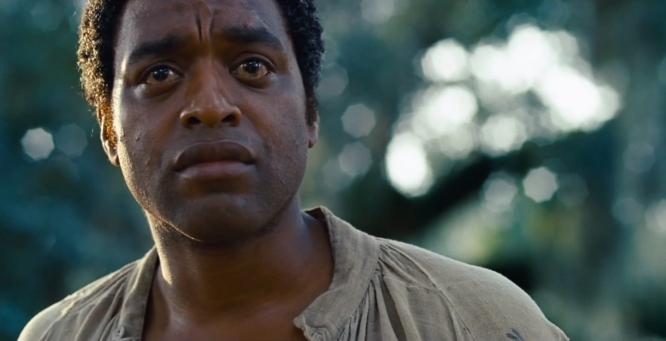 12 Years a Slave makes Roots look like a Disney entry on slavery. At times the supporting cast feels more like a visit to colonial Williamsburg , where you go from building to building, and the hosts play certain types that we encounter. All the archetypes are here. And all of them play like a game of guess the character actor. The psychotic overseer played by the always creepy Paul Dano. 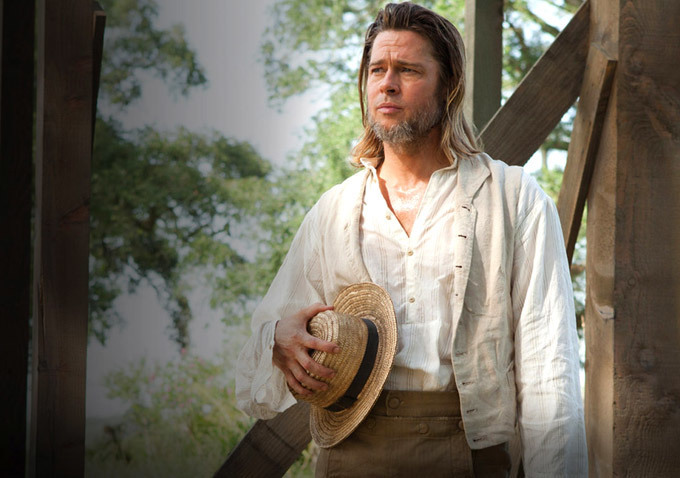 The abolitionist played by Quaker Brad Pitt, with thank-God-he’s-got-long-hair-again. 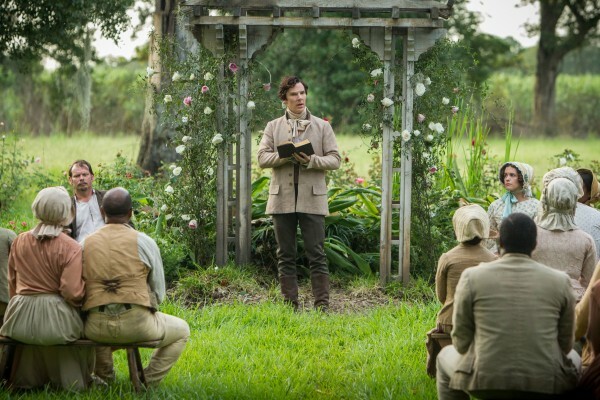 The pastor, who in all his kindness, still owns slaves, played by Sherlock Khan. The angry slave trader, played by everyone’s favorite angry imp, Paul Giamtti. Guest starring from Omar from the Wire. 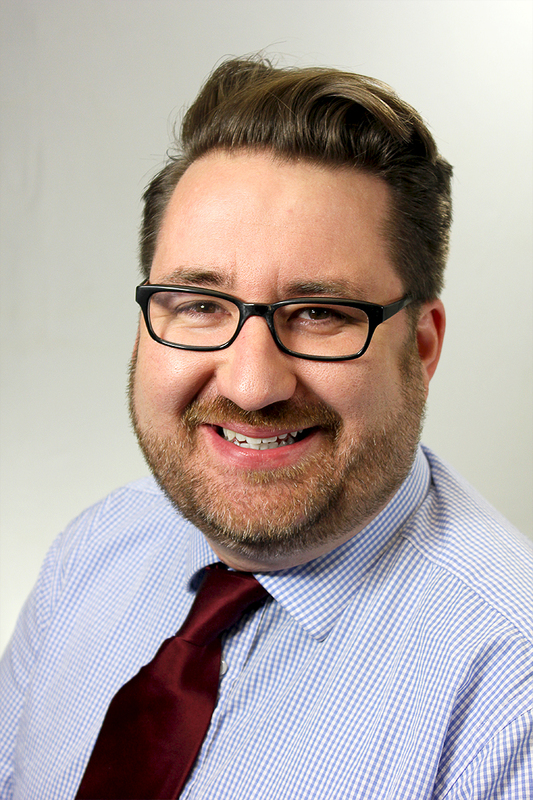 That dude from Mad Men who was fired cause he was gay, as the understanding Judge, who was still a slave owner. The cast of characters seemingly have no end in a mosaic of some fine performances and some, well let’s face it, over-the-top ones. Perhaps no other character is felt more real, other than Northup, than Patsey, the slave girl who is the object of the drunken affections of Fassbender’s slave owner, and the scorn of his knowing wife. In fact she becomes the deus ex machina for Northup. More on that in a bit. Ultimately our journey though, is with Ejiofor. And this does nothing in the way of diminishing our identification. Where other movies take us from Africa to the Americas, this film starts on something most of us can identify with: an educated working class family man. Last year brought us Lincoln, which was fine & all but the focus on that was the legalistic battles between great white men. Yeah the subject of their dispute was slavery, but rarely seen, and never felt. Nor is this last year’s Django Unchained, with Tarentino’s monologues on self-liberation. I do wonder if people see part of this film’s conclusion as merely a “white savior” ending. I don’t know that its for me to judge that, but I’d love to hear others takes on it. This film can almost make you feel depleted walking out of the theater. The journey you take is so hard to watch at times. You may find yourself NOT watching a great deal of times. McQueen almost has a journalistic approach to the story. Yet, it is a highly subjective film. A film that makes us feel slavery, brought to us by a brit. What is it about someone from outside our culture can make us examine our own history, like we sometimes cannot do ourselves? Music played such an important part of this film. 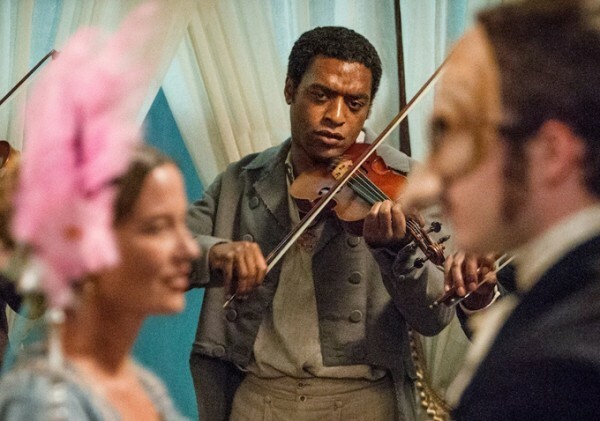 Solomon Northup was a violinist. Well, fiddler. Sure there’s a difference. Learning by ear. How its bowed. Doesn’t really matter though. MINOR SPOILERS (highlight to reveal): The catalyst of Northup kidnapping was taking an un-vetted gig, by people he didn’t know. To any musician, saying that music means a lot to them, is an understatement to say the least. You may even know musicians who do better with their music, than in love. To see a musician stripped of his ability and livelihood can not be downplayed here. Not to trivialize the gravity of his captivity, but surely to understand the totality of his plight, do realize that his inability to play, would be devastating, adding only to the horror that was dealt him. So when we see Solomon giving the opportunity to play again, we should see some joy from Northup, right? You see music here, becomes a token of Northup’s soul. it is taken from him. It becomes the embodiment of his freedom. A lesser token of what he’s going through. McQueen is obsessed with the soul. In Hunger Fassbender starves his body to save his own soul. In Shame Fassbender, again, gives up his soul for bodily pleasure. In 12 Years a Slave, Ejiofor gives up his soul to save his own skin. You can see it in his eyes. Even while playing music, it is hope deferred. It is just another thing, that will be taken away from him. Just as his freedom. Chip by chip, piece by piece. It is tearing down of the human soul. Slowly. Northup gives up himself bit by bit. The film is full of great music, both underscore by Hans “Inception” Zimmer, but the source music is where it shines. Choosing real life instruments & situations during the time. The violin used by the Native Americans with a single-string attached to a log; the field music that slaves sang to get through rough days; the spirituals that joined the community; the elitist dance music of the white upper class; to the bawdry dance music of the lower class whites. Patsey, who has all but given up on life, still sings. There’s a mother earlier who still grieves for her missing children. And she asks Northup, why he doesn’t cry for the loss of his own. He has no answer. Because he has given up hope. He has lost his soul in self-preservation. MAJOR SPOILERS: When Patsey does die, the slaves gather around her grave, singing a spiritual, only to find Northup, unable to muster the words. Finally he lifts his voice, in the true nature of the tragic spiritual. We see him regain his soul. 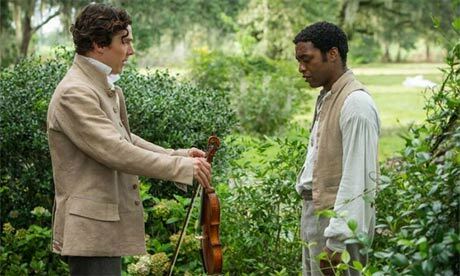 The massive injustice of slavery can distort reality in this film. You feel disoriented, almost siding with the kindness of certain men, only to remember, “oh yeah, they still own other humans.” Looking back at slavery through McQueen’s pretty, bucolic lens, it isn’t just historical. Its an immediate evil we mustn’t forget. That true ugliness in how we excuse ourselves, tolerate and ignore those around us, only dehumanizes ourselves. I can’t help but think of the biblical story of Joseph. A man who’s life is fine, albeit a bit spoiled, sold into slavery for over a decade. SPOILERS: Both men emerged humbled. I am reminded of a movie that came out a few months ago: The Conjuring. Both of these movies are getting high praise. Both use extended shots. Both have imagery of hanging. One film uses these devices for shock like a boo trick on a haunted house ride at the fair; the other for a deeply emotional resonance that pushes not only the narrative, but character as well. So why am I comparing a heady historical biopic against a halloween spookfest? Like I said, they’re both horror films. So what is a horror film? Does it seek to elicit negative emotional reaction? Does it play with primal fears? Does it startle you? 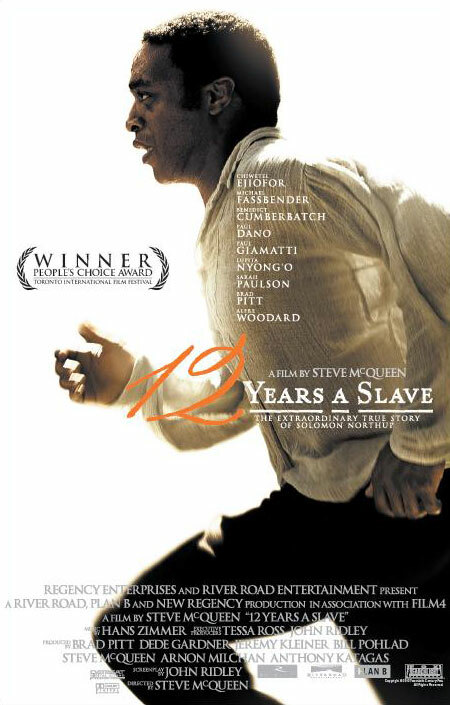 12 Years a Slave deals with a nightmare most can relate to. It is a hidden fear in a world where we know full well, slavery still exists at this very moment. The violence is revolting and the intrusion of the evil force is something that happened not too long ago. This was the everyday world. There was no need for zombies or serial killers. The zombies of the day were the ones who went along with this atrocity. The Vampires were the slave traders draining the life out of humans. Ghosts lingered in nooses left on trees. The werewolves were the religious who loved the slaves one minute, then defended the practice with scripture on confirmation bias. The overseers were the cannibals, tearing the flesh off these people. And off course the slave owners were the real life monsters. So yes, this IS a horror movie. And its one of the most important experiences I’ve ever felt.